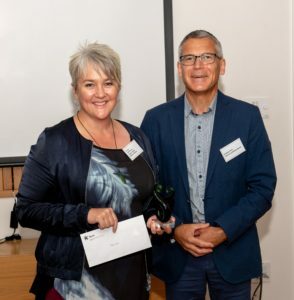 DIAA’s Programme Manager for Stepping UP, Sue Kini, received the Spark Foundation Most Valuable Partner (MVP) Award at the inaugural Jump Hui, held in Auckland on 30 November 2018. The Award was for the “person who went over and above in their role delivering the Jump programme”. In just two years, Sue has grown DIAA’s Jump delivery network to nearly 100 locations with another 30 in the pipeline. The number of families joining Jump through a DIAA partner has grown steadily in 2018, with a record number of 175 families joining in November. Sue was recognised for her willing and positive engagement with the team at Spark Foundation, contributing to the development of promotional materials and presenting ideas for expanding the delivery network. Tyson Tauri from Nga Tai o Te Awa in Whanganui, one of DIAA’s local delivery partners, was also recognised by the Foundation as the Jumper of Year, being “the person or partner who made a stand out contribution to the Jump programme in 2018”. Another six DIAA partners were acknowledged for their special contribution to the year – Moana Chalmers from De Paul House in Auckland, Anne Buck from Dunedin Public Library, Adele Hewlett from Timaru District Libraries, Paul Greville from Masterton Library, Seamas Fantham from Te Ora Hou in Wellington and Tessa Aylward from the Pukekohe Whanau Resource Centre.